A while back, around Thanksgiving, we watched a documentary of sorts about climate change. One of the main questions being asked by the documentary was why humans did little to stop climate change when they had the chance to do so. A good question. A good documentary of any sort captures your interest and imagination enough to invite some self searching and criticism even and this documentary was encouraging in this fashion. I started to wonder in what areas I could improve my demands on the planet and the resources we have here. That in turn got me wondering how useful and helpful smaller homes can be in terms of a part of a more sensible approach to development on this planet. Granted, I’m not so naive as to think that everyone in the world is going to move into a small house. I don’t even think that building more and more houses is necessarily a helpful solution. Imagine going bananas with downsizing and then throwing away things or building something that you later come to think was all a big mistake. Then you re-buy or re-build and voila, we have more waste than we started with! More reasonably, what I focused on are some of the things that go hand in hand when considering more size appropriate housing solutions. For one thing, many people properly considering downsizing, rightsizing or whatever you call it, for their living needs – myself included – go through a long period of analysis of their physical needs before taking the actual step of moving into a smaller space. For instance, the de-cluttering process comes to mind. People have all kinds of creative approaches to finding out what they really find meaningful among their possessions. Some people just go straight at it with the pick-up truck approach and make major donations to thrift stores, friends or neighbors in need. Yard and garage sales help too. And frankly, we can’t ignore the huge pile that goes straight to the landfill, still with us and generations to come, but no longer sitting in our closets. Some people try putting a lot of their excess in storage and then seeing what, if anything, they miss over the year. If nothing, they give it all away (or sell it, or what have you). Shawn and I have had an interesting, multi-year and ongoing de-cluttering process that has been both intentional and accidental. We sold our house in Washington state – including most of the furniture in it to the buyers. We hadn’t intended to, but it seemed sensible at the time since we were planning a move across country and the less we’d have to haul, the better. We also enjoyed a huge yardsale of things that we really didn’t have a lot of need for. Once we reached Maine, we rented an abominable seaside cottage. It should’ve been wonderful overlooking a quiet cove but, unfortunately, many of our things in boxes were ruined by mold. This was an accidental downsizing, but aside from a few items and the intense irritation that came with the experience, we didn’t really miss much of what went into the trash. Than, after spending nearly three years building a wonderful house in Maine, we decided to move back to the west coast. Believe it or not, we had another moldy rental experience when we came back to the west coast that caused more irritation and more losses, but we’ve dealt with that as well. Now that our home is small, we’ve continued to be critical about the things we bring into our life and after several years of this, we find that we have a lot of things that are really nice in our lives, but it’s not a major overflow. We’re pretty darned satisfied, and like most of us in wealthier parts of the world, we still have an abundance.During the months leading up to this return move, we decided to further scale back belongings, keeping the things we loved most and that had strong sentimental value to us, along with the practical tools and things we use and enjoy on a daily basis. We’ve always been book hounds and it was surprising how long it took us to pass along certain books we’d lugged about with us for literally thousands of miles! We still have a pretty large personal book collection, but we’ve been happy with the change; we’ve kept the useful and dearest of our books, allowed the others to have new homes and now use our library a lot more than ever before. So what about all this musing? Can smaller homes be a part of the solution? I think perhaps best in the sense that if careful thought and planning goes into the idea and eventual process of downsizing, we may find that we come to a better understanding of what we actually need in our lives. Maybe the physical limitation that comes with less space encourages our thinking about what we really need and want to include in our possessions. This mindfulness in turn helps us (or can help us) be more aware of our purchasing in general and we may truly find that we do less of it. And, quite honestly, you don’t need a tiny house, a small house or anything besides what you already have to get this ball rolling. For mindfulness, all we need are our minds engaged and our actions to follow. I’m still not sure if I’m an optimist or a pessimist when it comes to the future of humanity and the other living things our behavior so strongly influences on this planet. But move forward we must – and will. I appreciate being able to make changes along the way in my life and hope that cumulatively, the actions of many of us can make a lasting impression on the larger world.I don’t think small houses in and of themselves are a total solution to the challenges facing the planet and its entire population, obviously. Indeed, constant building of any kind uses a great deal of resources and requires changing our landscapes in ways that are ultimately permanent in terms of local ecosystems. We should be critical of our buildings and make sure we ask pertinent questions when building and changing our surroundings. But that seems to be a strengthening process. Because if we’re asking the questions and taking the time to consider our real needs, we are part of the way toward asking that question wherever we go in the world. And if some of us are starting to ask that question regularly enough to incorporate the questioning into our behavior, then we may have influence again on people we know and on and on, and so forth. In fact, all of this can come to fruition regardless of whether we actually take the further step of downsizing, building small, or doing anything at all outside of living our daily lives in a slightly different way. Here’s to a thoughtful, critical, joyous and mindful 2013! 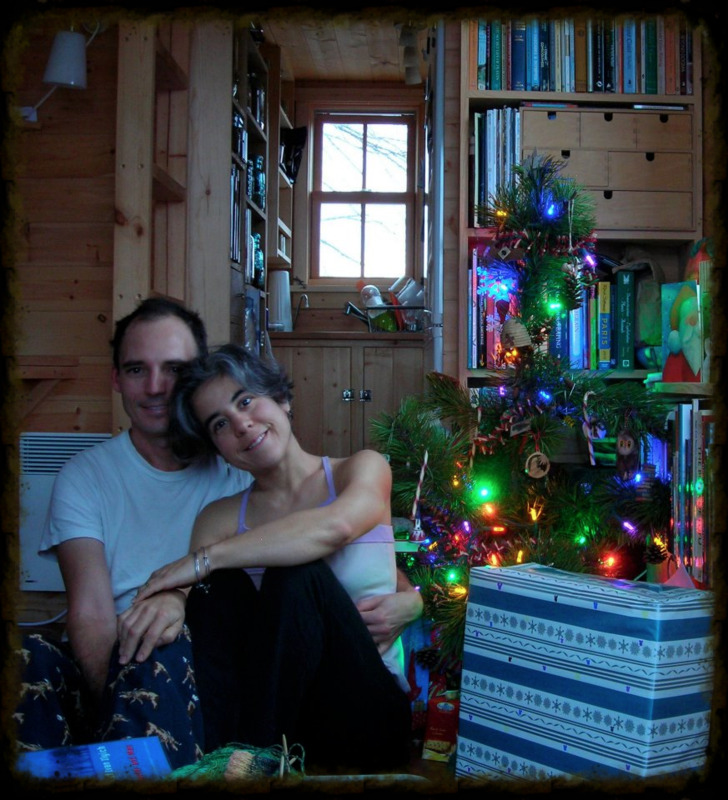 A simple Christmas celebration in our tiny Moschata Rolling Bungalow.